My first time at the famous motor-racing circuit and I had been planning this forEVAH!! I got my ticket from the guys, train ticket and everything ready to go well in advance, but on the day it took my brain an age to get going, My carefully written out itinerary was left behind on the table and so I raced off to get the 26min past train, which was the train I got lat week to Antwerp! At least I was 10min early for the train I actually needed. The adventure really starts with getting off the train at Verviers I’ve never been here before, but I doubt the walk from the train to the bus stop really counts. Yes. 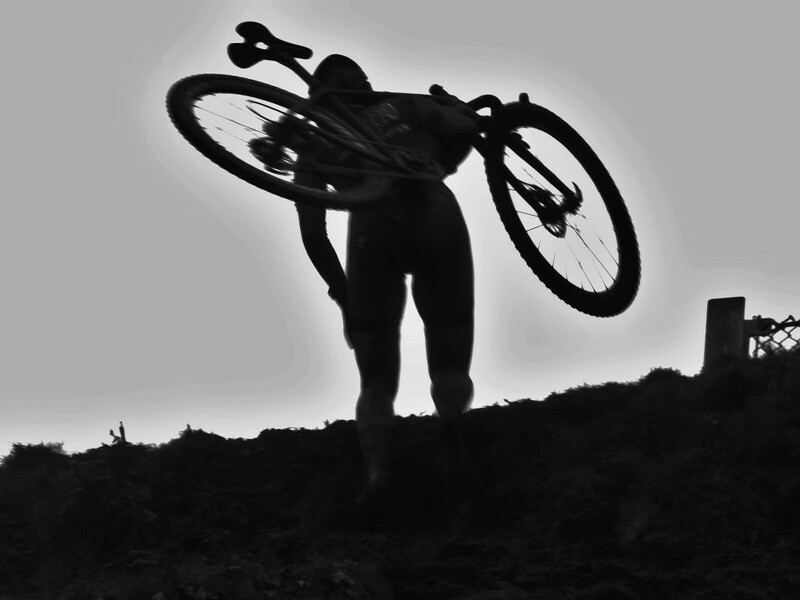 I spied a group in boots with ruck-sacks and my CX radar switched on. Yes. 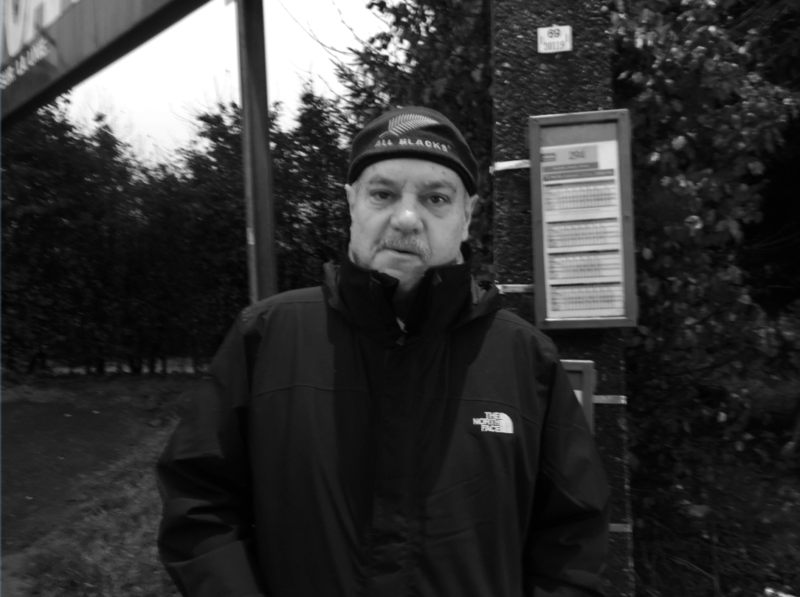 they were going to Francorchamps, they knew which bus, which stop to get off at and as soon as they discovered my heritage, Lucien’s first words were ‘Jonah Lomu’ and out came an All Blacks beanie! Chur Bro. I lost them as we got to the course, when I got caught up with the excitement (SQUEEEEEEE) and taking bad photos of bugger all and I turned round and they were gone (sad face). 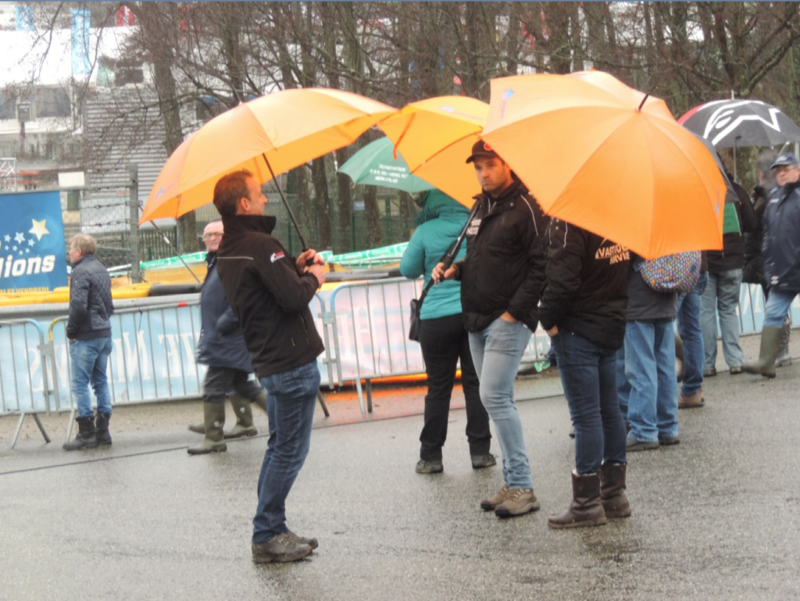 Yes, the umbrellas were out. 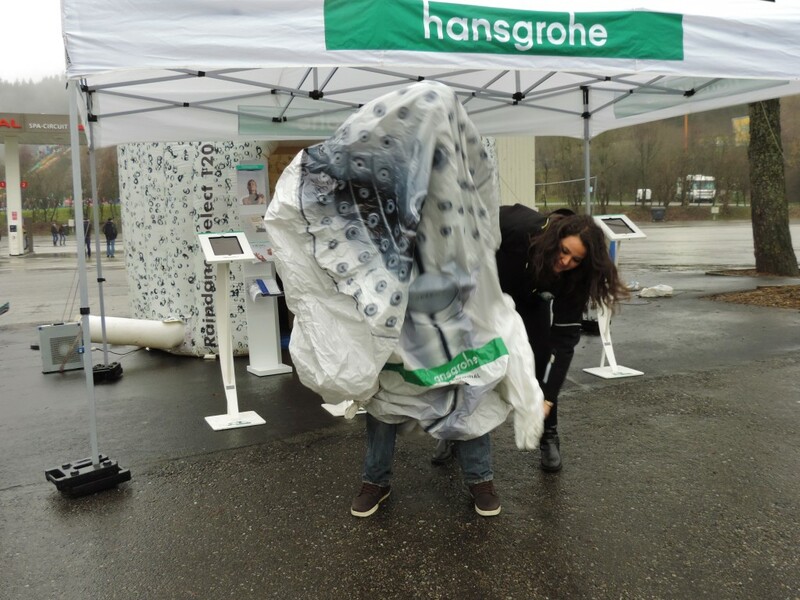 It wasn’t heavy rain but persistent drizzle that seeps into your clothes and feels really cold. Normally, I save an extra layer for later in the day, but I felt like it needed to come out early today. 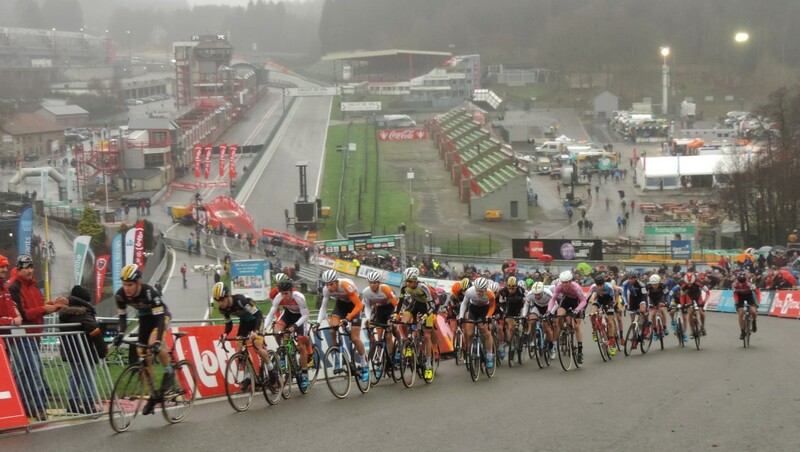 It was Jappe Jaspers, Mitch Groot and Florian Vermeersch that started off strong, but in the end it was Seppe Rombouts who proved to be the better climber and have the greater stamina, as he did at Koppenberg. He was joined on the podium by Jarne Driesen and Thymen Arensman with new European Champ, Jens Dekker 4th in the blue. It was with the Juniors that I got my first experience of The MUUR. Now, I have been up the namesakes at Geraardsbergen and Huy and compared to this they are nothing! Yes, of course they are longer, but blimey …WTF …Holy crap … You’ve got to be kidding … Sheesh …that’s a tad steep No way, mate. 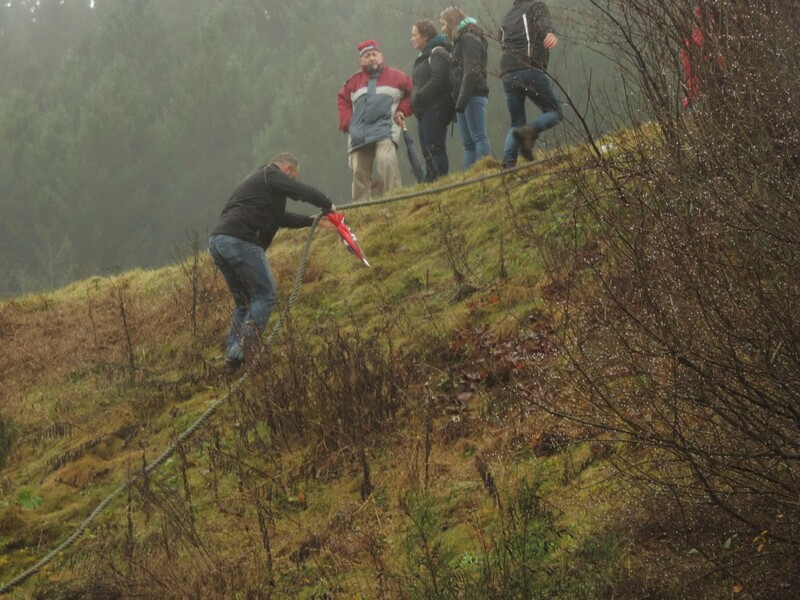 The organisers had provided a couple of ropes for us mortals to get up there, but I thought better of it. On the way back to the start line I find another run-up and the women practising. Me and my fellow friendly spectators, who had set up base camp here, gotan unexpected treat when we saw the rainbows on the dark shirt coming up the hill. MvdP getting in an early practice and mixing it with the girls. I guess he still thinks he’s riding the U23’s! And YAY! there are permanent, indoor toilet facilities with a hot air blower for drying off your hat a bit! Time for a quick coffee (no beer today) and a delve into my packed lunch before the U23’s and I’m heading up to the top of the asphalt hill this time. Unfortunately, with all the drizzle visibility is a bit impaired, but I see that the K-Pauw bus has arrived and there’s some “Hi, how are ya’s?”. One day, I will travel with the rest of the herd. 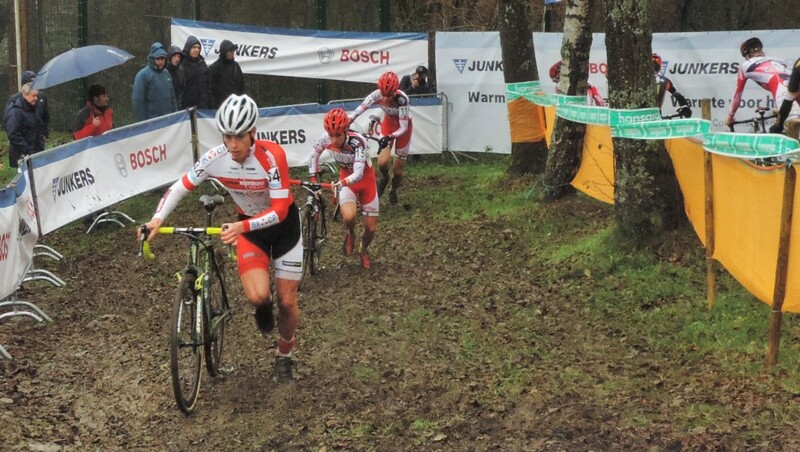 Suitably refreshed, I get a spot by the barriers and see Nicolas Cleppe getting the holeshot. Nicolas didn’t quite lead from start to finish, but got the bits that mattered after a head to head with Yannick Peeters with Eurochamp Quinten Hermans in 3rd and crowd favourite, Eli Iserbyt (now studying Law at KU Leuven, I believe – Smart arse!) making it to 4th. I had managed to work out how to get to the Eau Rouge part of the course during the race (geographically challenged and I don’t really follow F1 so didn’t really know this was a thing!) and now it was just a matter of going through the tunnel to the mobile homes. 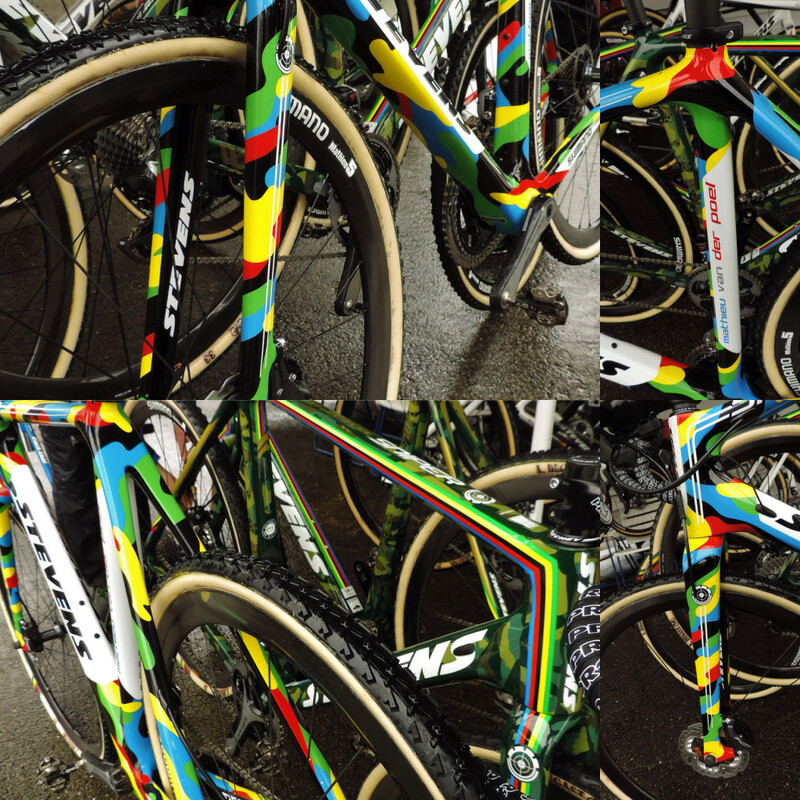 Unfortunately, the only ones close to the course were the elite men, but how many photos can you take of the Rainbow Camo Stevens? Note to my followers on Twitter -please let me know in advance if you need on-course updates. I didn’t realise you had no idea what was happening until the last lap. I apologise for the poor quality of updates, but I am still not good at typing with these false fingernails and my phone got a bit wet and had a bit of a tantrum! 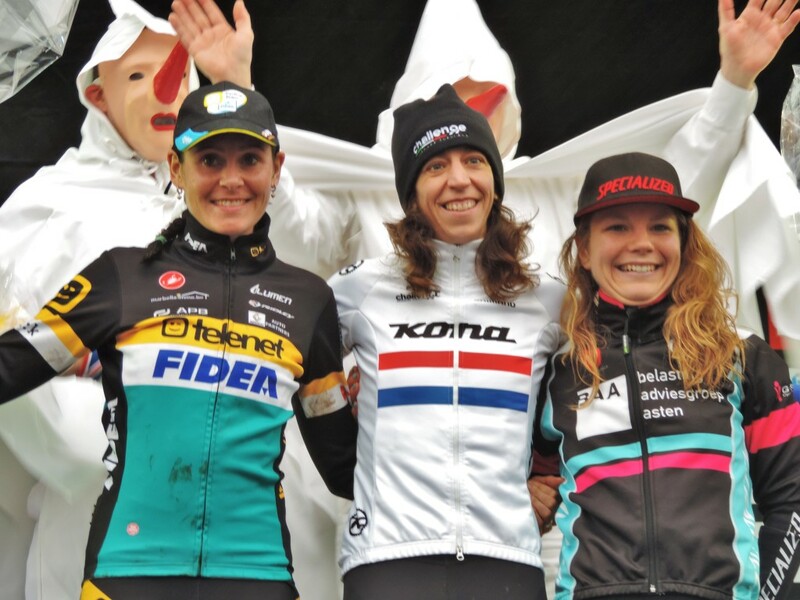 Dear Superprestige organisers and Telenet, you are so late to the Women’s Race party it beggars belief. Sort yourselves out. YAY! 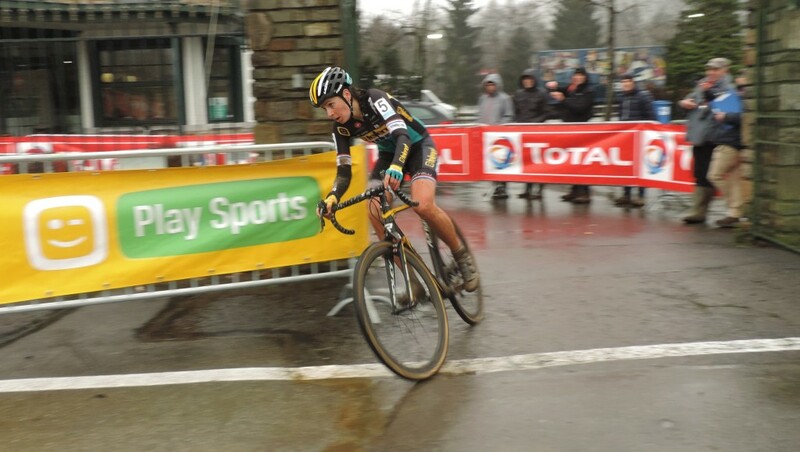 Elle Anderson is back racing in Belgium. 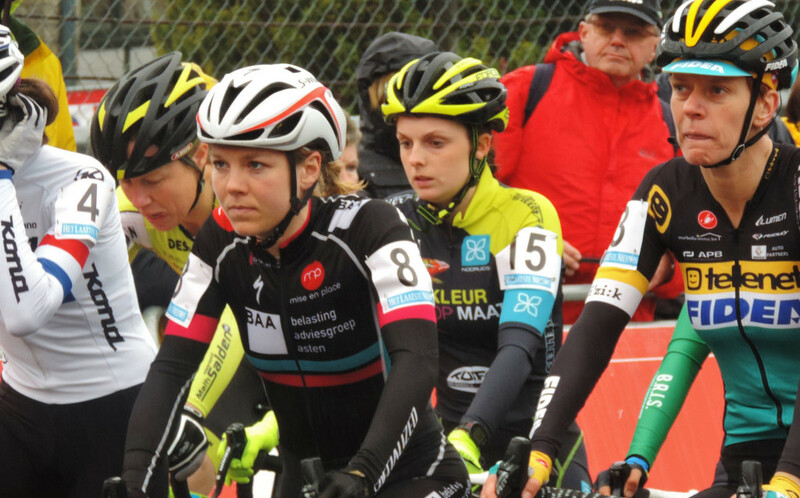 I managed to get a photo of Sanne van Paassen NOT smiling! Helen Wyman was doing a good job of promoting her clothing as I had seen her in white in the morning, blue at lunch and she lined up in red! Master of the quick change! 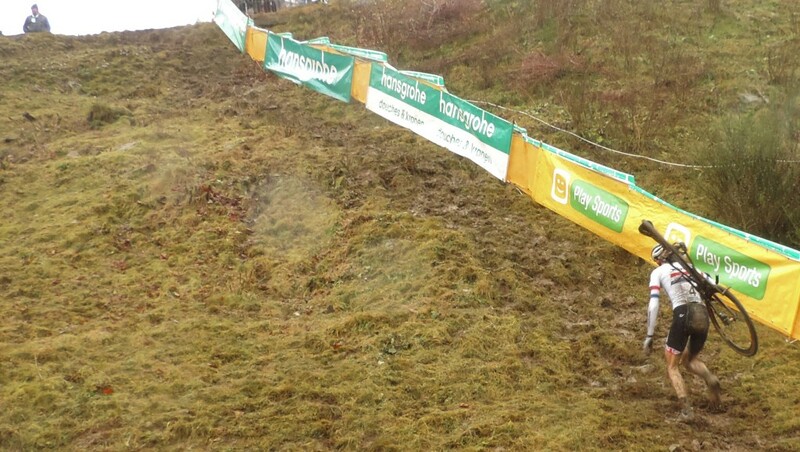 Nikki Harris took off up the hill and gapping the field straightaway. 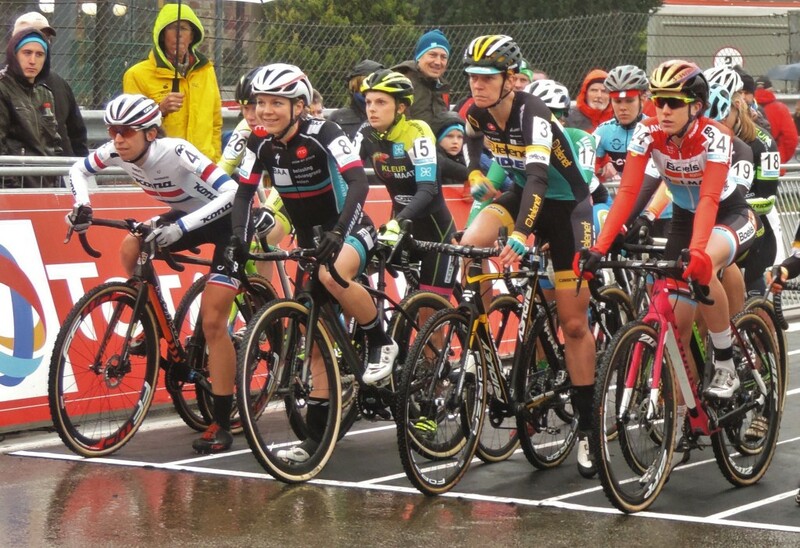 By the end of the first lap she was on her own with Christine Majerus leading the chasing group with Helen Wyman, Sanne van paassen and Ellen van Loy and another gap back to Femke van den Driessche, Jolien Verschueren and Sophie de Boer. By lap 3 Nikki was still leading, but the chaser was Helen Wyman steadily eating in to the lead, Sanne van paassen in a solid 3rd and Christine Majerus had dropped to 4th. I wondered if I had maybe got the start time wrong, but no, the women got short-changed on the timing again. This meant I had to run to the next part of the course I wanted to see them at as there would be no ‘next lap’. As it was, Nikki was still in the lead a they went past me, but Helen was giving it everything and the final stretch up to the finish line she managed to pass and pull 8 seconds clear. What an effort! What a race! Wish I could see that again. Thank you Sanne van Paassen for what may be the only live recording of that race! 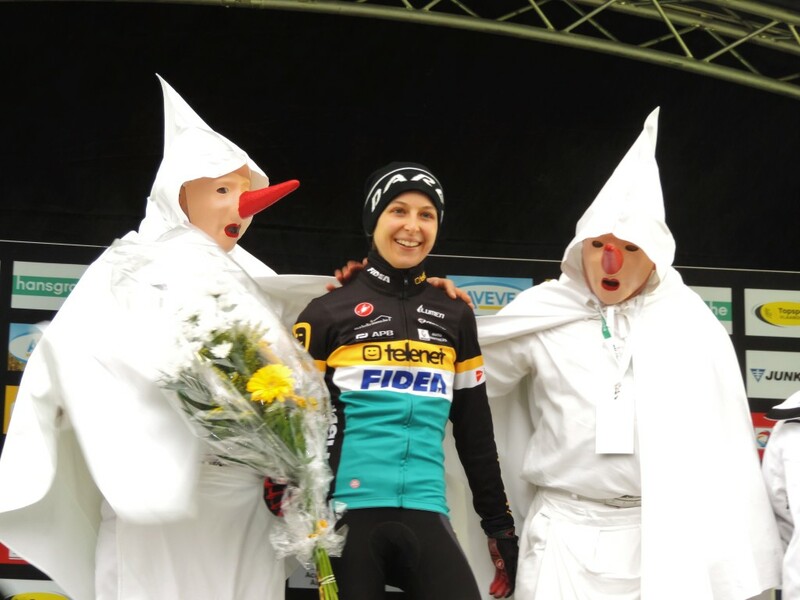 On the podium you will all have seen the creepy guys dressed in bed sheets, pillow cases and big red nose masks –www.laetare-stavelot.be/en/ Nothing more to say on that. I would be interested to see the gate numbers this season to last. Again during the men’s race I am pretty much able to get to most spots on the course without too much difficulty (except for the 4 rudest people ever at the bottom of the Muur. I won’t bother with more words for them). Yes, I was as hopeful as any Kevin supporter after the result last year. Had the Spanish sojourn has the desired effect? Of course, every other bugger seemed to be either in Calpe or Mallorca so does that make the field even? And what was that on his head? Please tell me that was a last minute replacement ‘cos someone forgot the real helmet! Now, I know y’all saw the Men’s Race. 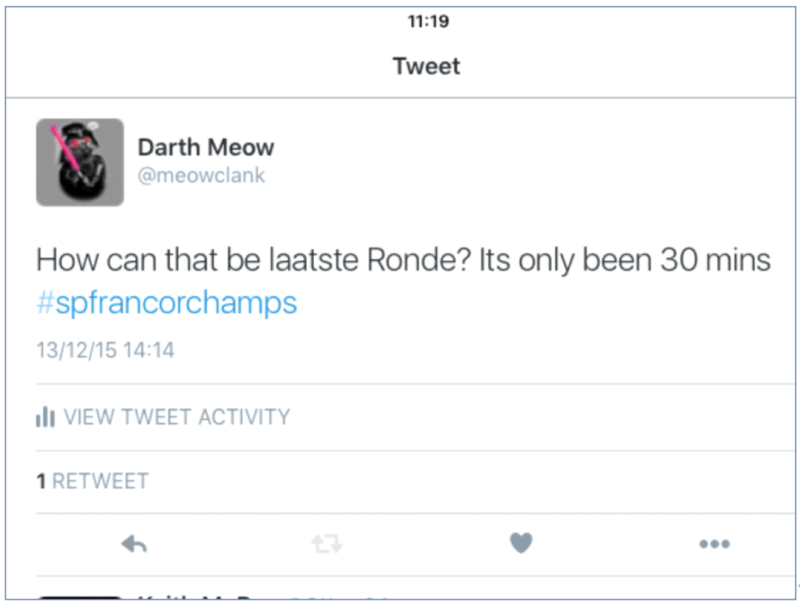 Wout is a freak, right? No special Niels juice just the love of a good woman, huge lungs, strong legs and a cute dog, but a total freak! We stood and clapped his incredible performance still with 3 laps to go. No one to touch him this day. 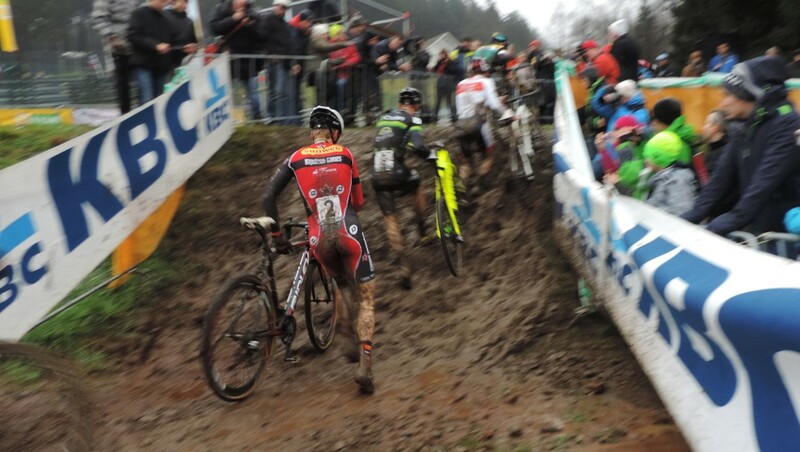 Sven and Klaas had their own battle and you had to feel for Klaas as Kevin passed him on the line. Of course Kevin still has to fight for points and we love to see him again on the podium, but I’m guessing he didn’t win any points in the ‘favourite teammate’ stakes! 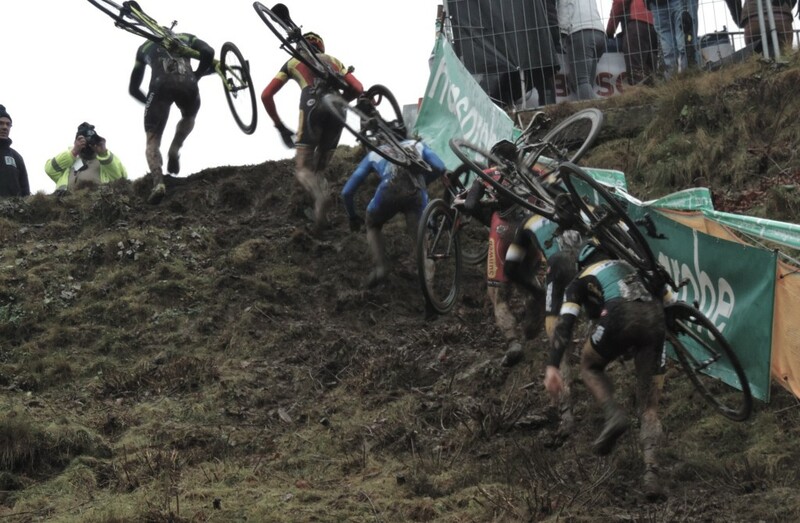 Mathieu van der Poel is still having trouble staying upright and we really haven’t seen much of Lars since he put on the blue cossie. Big shout to Corne van Kessel who has been getting some great TV time over the last couple of races and got a very well earnt 5th place. 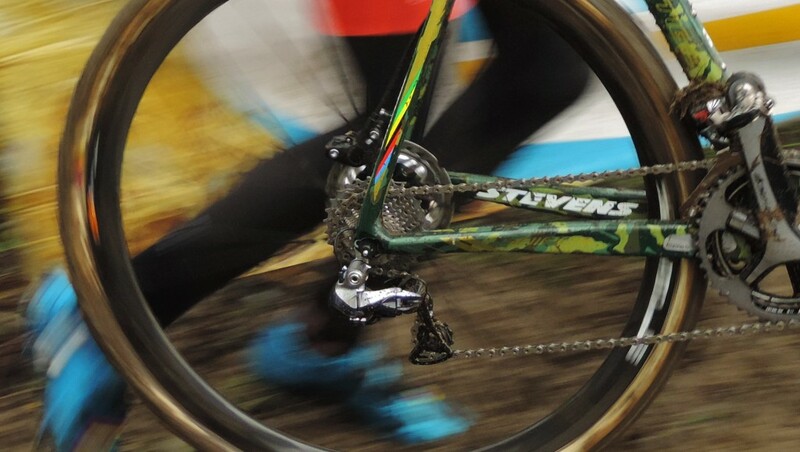 Last year my camera loved taking photos of Laurens Sweeck, but this year I don’t think I’ve got him in focus once! Oh well, time to hit the road back and it was all uphill back to the bus stop, but YAY Lucien and his family were there again and they were super-happy for their man Sven. The supporters buses passed us waiting with their spare seats full of crates of beer and the Sven supporters made gestures for us to come in, but the buggers didn’t stop! With it taking 3 hours to get there and 3.5 to get home will I go back to Francorchamps? Yes, I will, but I’m gonna be on the Kevin supporters bus! Save me a seat! Lucien and family left the journey in Liege, but I hope they come to Namur. 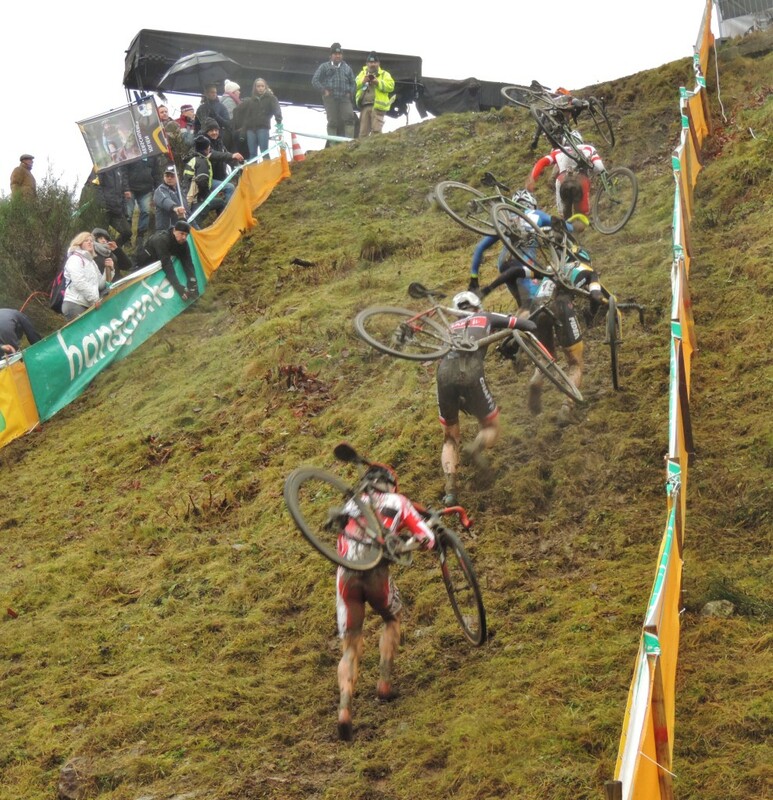 I fell in love with Namur the first time I went there for GP Wallonie and last years Kevin win was very special. 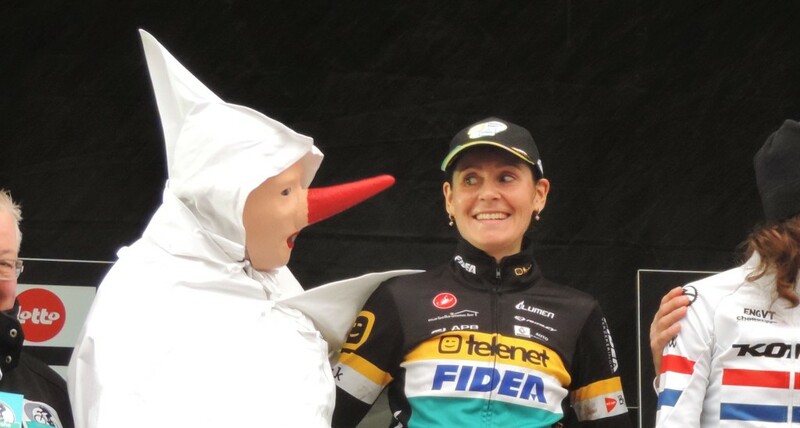 With no Marianne Vos, PFP or Katerina Nash will we see Sanne Cant, Katie Compton, Helen Wyman making the running or will Christine Majerus run of form keep her in the hunt with Jolien Verschueren? I am rubbing my hands together at the prospect.